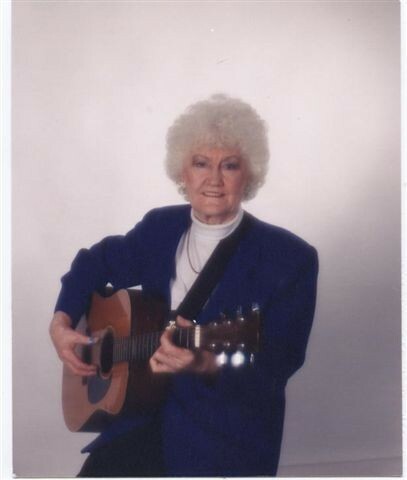 Singing and playing the guitar was something Velma Hood did every single day. Music was something she always loved, even as a very small child. Her daughters will tell you that never a day went by without her picking her guitar and singing an old gospel song or two. Her favorites were old ballads, gospel music, and of course, Mother Maybelle songs. Her name was Velma Brown Hood, someone whose voice sounded a lot like Mother Maybelle Carter. And when Velma passed away this past August, she sang at her very own funeral. Born August 6, 1924, in Jackson County, Velma was one of nine children of Samuel Lafayette (Fate) Brown and Sarah Amelia (Sally) Masters Brown. She had a twin sister, Thelma. Their home was in the Old Antioch Community of Jackson County. The Brown family moved to Overton County in 1942, and settled in the Holly Springs Community. Velma and Thelma were the youngest of the nine children whose names were Verdia, Inez, Ella Mae, Eva, Lester, Albert, and Clyde. None of the nine children attended high school. In 1948, Velma married Clarence Hood from Highland Mountain. After they married, the young couple lived in the house with his parents, Floyd and Lou Hood, and in 1965, they moved to town. By this time, three daughters had been added to their family, Claudette, Paulette and Sharlotte. During the time the Hood family lived on Highland Mountain, Claude Ramsey was a regular visitor at their home. He would stop by their house to rest on his way to Copeland’s store, and then on the way back from the store, he would stop and visit a little while too. Velma worked at the Livingston Shirt Factory until it closed, and had various other factories jobs after the closing of the shirt factory. In addition to farming, Clarence was employed at the box factory in Livingston. In August of 1967, as Velma was getting ready for work one morning, she called out to Clarence, who had not yet gotten up, to get up and get ready for work, that it was getting late. When he didn’t respond, she went to check on him and found he had died in his sleep. He was only 43 years old, and had suffered a massive heart attack. She was left alone to complete the raising of their three daughters which she somehow managed to do on an income of less than $4,000.00 a year. And even with just a factory job to support her family, her daughters say that they never did without, that somehow their mother provided for them. Paulette remembers that the only thing she ever asked for that she didn’t get while they were growing up was a pony. Several stores in town ran accounts for Velma, and she allowed her daughters to charge things at these stores, and each pay day, she went by and paid for whatever had been charged out of her shirt factory check. Velma was a member of the Three Forks Baptist Church. She attended regularly until she wasn’t able to drive anymore, some three or four years before she died. She read her Bible every day. Sharlotte remembers how they had to be in church every Sunday, but sometimes even little kids didn’t want to go, but it was understood, it you were Velma Hoods’ girl, you would go anyway. One of the things Velma was well known for was her great sense of humor and for her sayings. She had a saying for everything. It was not until she had passed away that her daughters found two notebooks in her handwriting she had kept that were filled with quotes she must have thought should be written down. A couple of examples of what the notebooks contained are: "If a task is once begun, never leave it till its done, be the labor great or small, do it well, or not at all." Another reads - "He who stretches the truth too far will find it snaps back in his face." Velma was a great source of entertainment for the women she worked with. She was still employed at the age of 75. She was lovingly referred to as "Hood" by her fellow workers and others who were close friends. She took great pride in her personal appearance, and would dress each day with careful attention to how she looked. Pretty jewelry and scarfs were included with whatever dress she picked out each day, and never ever did she wear pants. High heels were also something she loved to wear. Sharlotte described herself as a person who could make her mother madder "than anyone on the face of the earth." She said her mother told her that she (Sharlotte) reminded her of Clarence Hood and as long as she was alive, he would never be dead. Paulette told me her mother first picked up a guitar when she was only four years old, and that she didn’t think she ever put one down after that. She played the guitar every day of the world. She went on to say that if someone called her mother just about any time of the day and asked what she was doing, her reply would be "just pickin’ this ole guitar and singin’ a little." Paulette took her on two occasions to have her mother’s picking and singing recorded from which CDs were made. It was one of those CDs with her mother’s recorded music that was played at her funeral. The preacher who held the service told those who attended that Velma finally had the last word. Velma’s oldest daughter, Claudette, lives in Florida, and visited with her mother by telephone every day. Claudette came home to visit her mother for a week in May of this year, and took her mother to visit lots of friends and relatives during that visit. She described her mother as a person who would literally give someone the shirt off her back. She said on many occasions, her mother had given away clothes to others after being told something she was wearing looked nice. She would launder an outfit and tell the person she was giving it to that she was tired of it. Claudette says she can only hope to be as loved and respected as much as her mother was. Sharlotte told me she thinks she was born to the best parents on the face of the earth, and that she couldn’t have had a better childhood. She said her mother called her daughters The Three Stooges, and she loved each one very much. Paulette’s husband, Willie Roy Sidwell, was Velma’s favorite son-in-law, and she let everyone know that was the case. If Willie Roy and Paulette took Velma something from their garden, she always told everyone Willie Roy brought it to her. She and Willie Roy never exchanged a single cross word with each other. Judy Crabtree described her good neighbor Velma as a very special person, and someone who never complained. She and Velma talked on the phone several times a day. Carol Gilpatrick got acquainted with Velma through Paulette, and enjoyed very much that special friendship. They had many good visits over the years, and shared lots of laughter. A trip to Tunica, Mississippi was how Velma celebrated her 80th birthday, a gift from her daughter, Sharlotte. Many years before, she had taken trips to California and Las Vegas, and one of the things she enjoyed most about each of these trips was playing the slot machines. Even though I never had the opportunity to meet Velma Hood in person, it is surely evident to me that she continues on in the daughters she left behind. That sense of humor and quickness to tell you just exactly how things stand is alive and well in the girls. Velma Hood passed away on August 29 of this year. She had just celebrated her 80th birthday on August 6th. Sharlotte said she didn’t think her mother was afraid to die, "she just hated to leave us." She may be physically gone, but her voice remains on the CD doing what she loved to do most. It will be cherished and treasured by her daughters, her five grandchildren, and eight great-grandchildren for many years to come.